Argyle Feed & Hardware Wins Best of Denton County Feed and Hardware Store 2018! 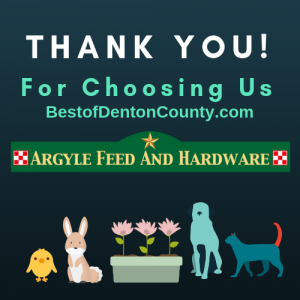 Thanks to you, our loyal customers, Argyle Feed & Hardware is pleased to announce we won the Best of Denton County Feed and Hardware Store for 2018! The Best of Denton County is an annual contest that encourages customers to nominate and vote for their favorite businesses in Denton County across a variety of categories. These categories include Community & Non-Profit, Beauty Services, Home Services, Restaurant/Food, Financial/Real Estate, Legal Services, Specialty Services, Sports/Fitness/Nutrition, Shopping/Retail, Medical/Health, Entertainment/Travel, Education, Business/Professional, Automotive Services, Bar/Nightlife and Pet Services. Stop by Argyle Feed & Hardware and experience our service and shop our products. You’ll find pet and animal feeds and supplies and a great variety of hardware supplies. This entry was posted on Tuesday, September 4th, 2018 at 5:51 pm	and is filed under News & Updates. You can follow any responses to this entry through the RSS 2.0 feed. Both comments and pings are currently closed.